Me photographing Mt. 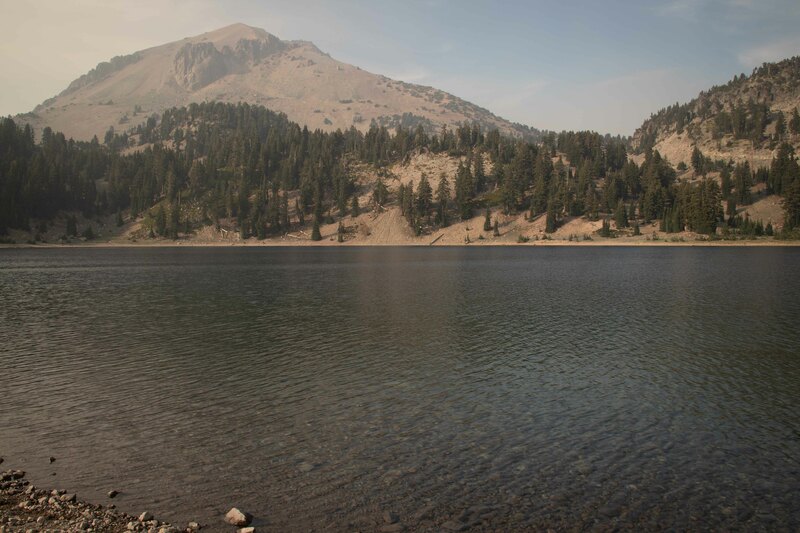 Lassen and Lake Helen. Photo by Eric. Our planet has revolved around our star 27 times since we stood at the altar and exchanged our vows. 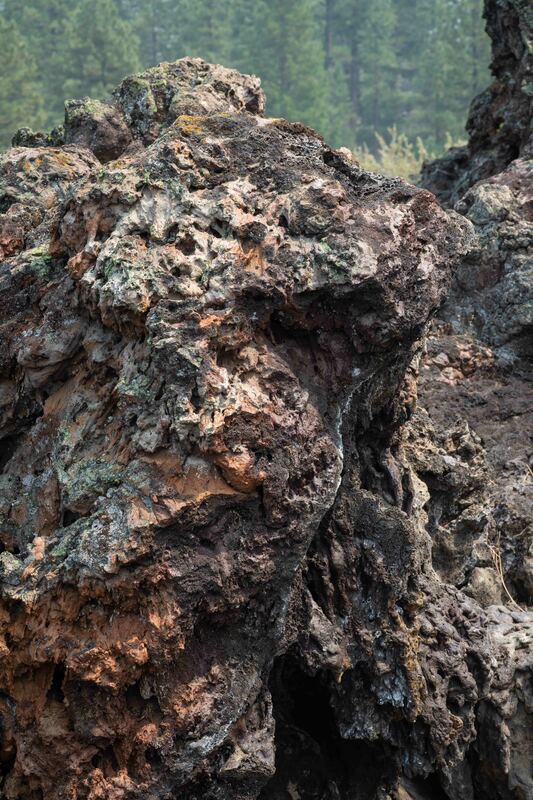 Once again, we are celebrating our anniversary in the midst of lava, this time in the Lassen area. 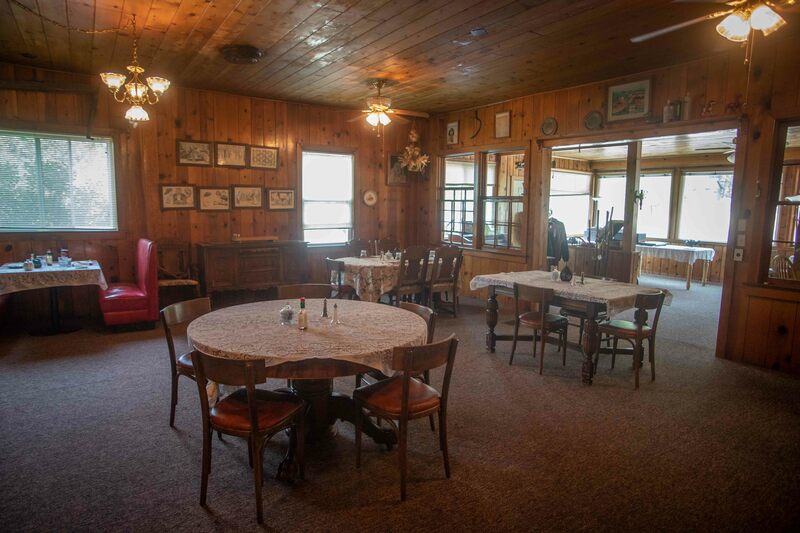 We had long wanted to spend a night at the St. Bernard Lodge. 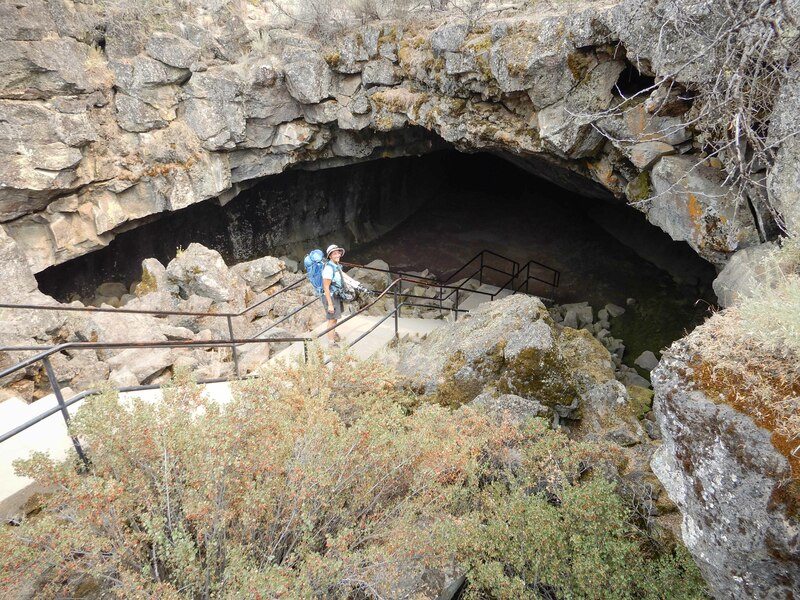 I wanted to bring Eric to the Cinder Cone and Subway Cave, which I had explored with Williams Geoadventures last year. As the lodge was near Lake Almanor, we decided to take the opportunity for our annual paddle in the Weeble. Mather's roof rack makes it much easier to attach the Weeble to him. Photo by Eric. However, as the lodge does not accept any check-ins after 22:00, we needed to spend Friday night somewhere else. The Super 8 in Red Bluff seemed most practical. Practical, that is, until a few days before we left, when the Carr Fire broke out just west of Redding. 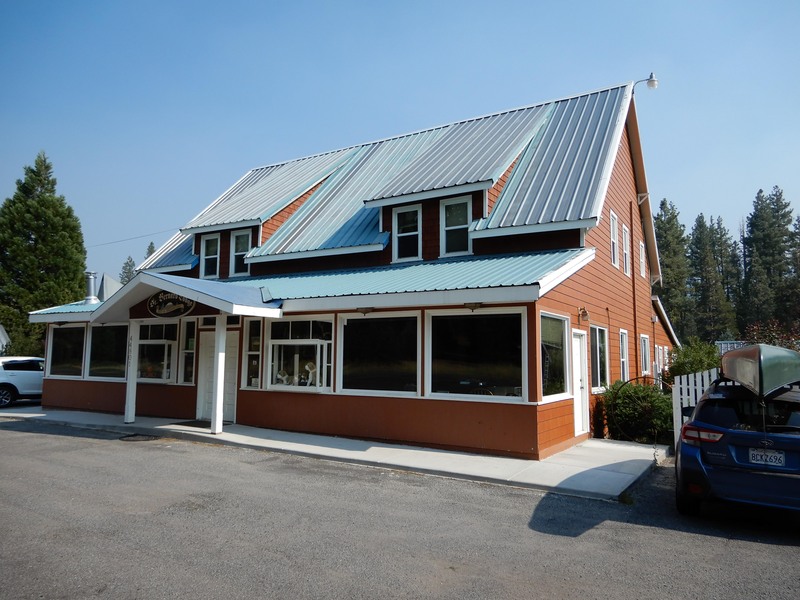 The innkeeper called us mid-day to make sure we were still coming, as he would much rather have rented our room out either to a firefighter or an evacuee for almost twice the price of our reservation. Fortunately, Eric was home to tell him, yes, we were coming. Parking lot full of firefighting vehicles. 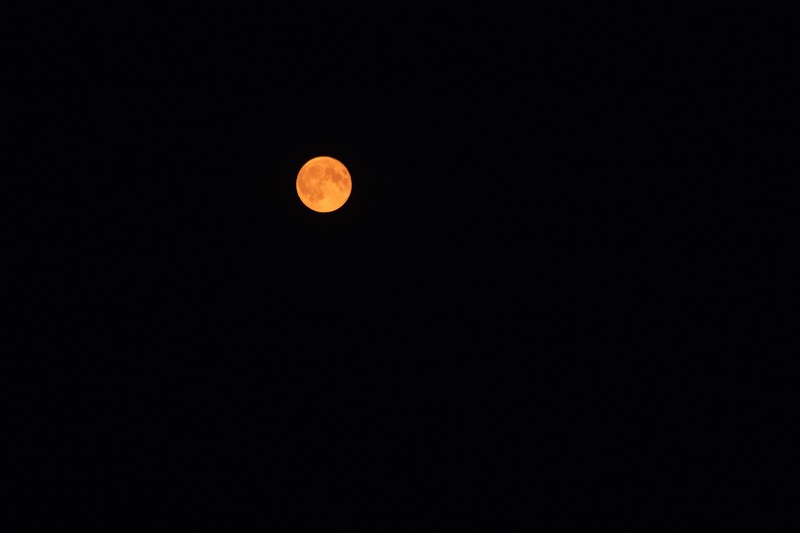 Smoky red moon from the Super 8 parking lot. I was astonished at what a photographic target-rich environment the Super 8 parking lot had become. 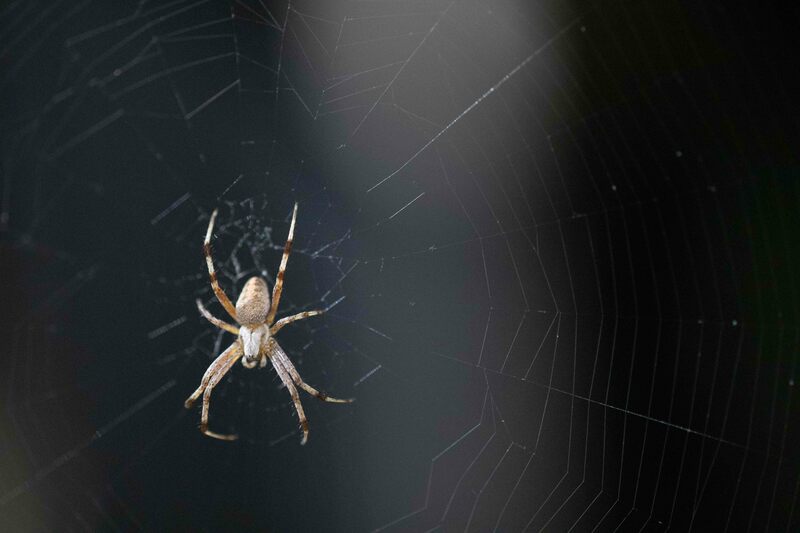 In addition to everything else, I found this amazing orb-weaver. 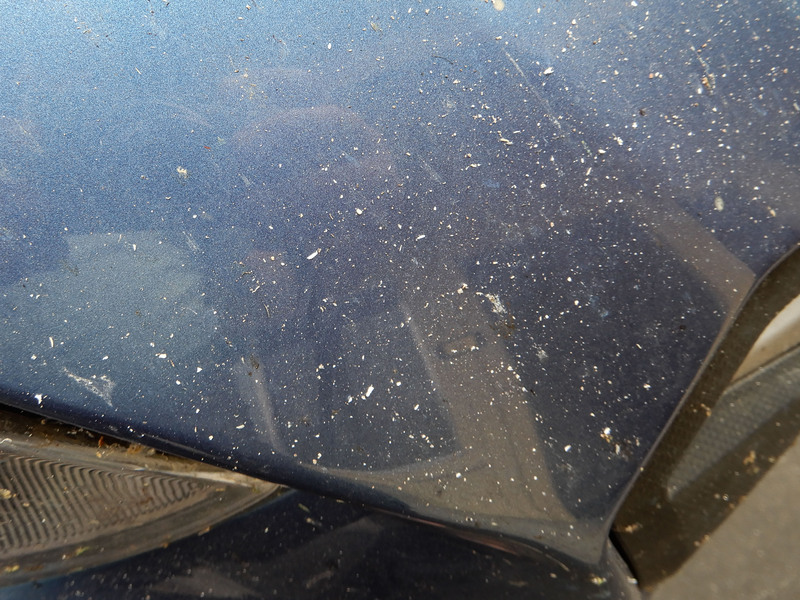 In the morning, Eric took a picture of all of the ash that had landed on Mather overnight. 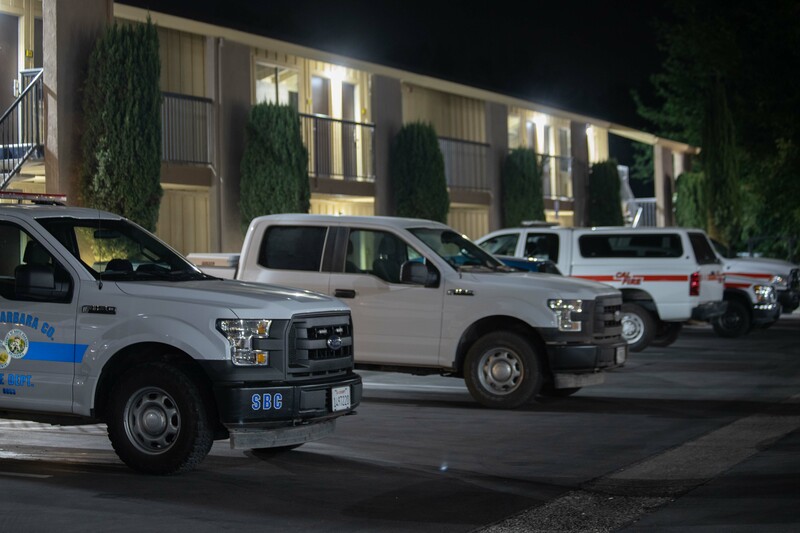 The Super 8 Red Bluff breakfast was so substandard that we are thinking of paying the extra money to go to the Super 8 in Redding from now on, assuming it survives the fire. I will spare you the miserable emotionality of being among the evacuees. Our hearts go out to them. Lake Almanor, formed by one of PG&E's dams, is probably beautiful in other weather conditions. See the contrast between the lovely clarity of the water and the haze in the sky. 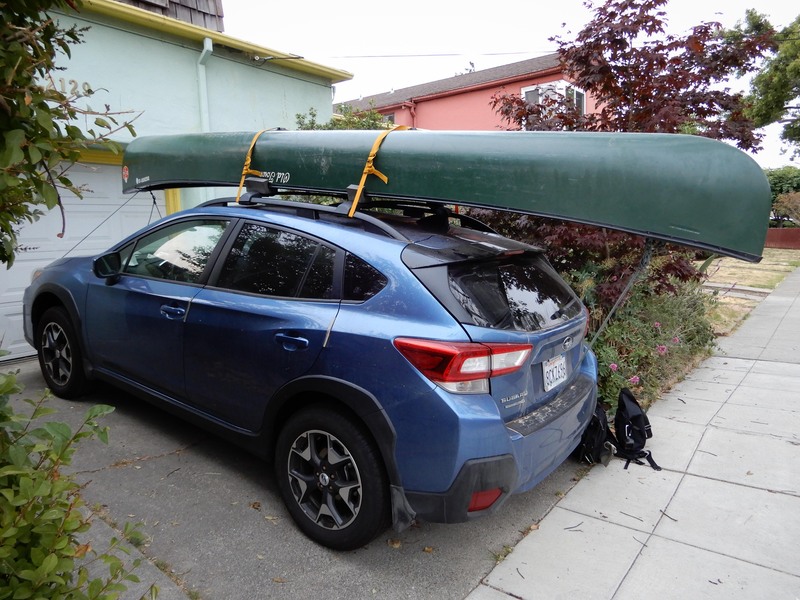 Our paddle would have been more fun with a working GPS. We had been planning on looking for a cache on an isolated island in the lake. Eric spent much of the paddle out trying to make the GPS function properly. It turned out in the end that the isolated island was submerged when the water was high, as it apparently was when we were there, because all we could see was a wind sock. We stopped on a small peninsula to take a dip in the water. I thought I had taken a nice picture of the peninsula, but apparently I failed to depress the shutter button appropriately. The peninsula had a lovely curve that I can now only describe in words. 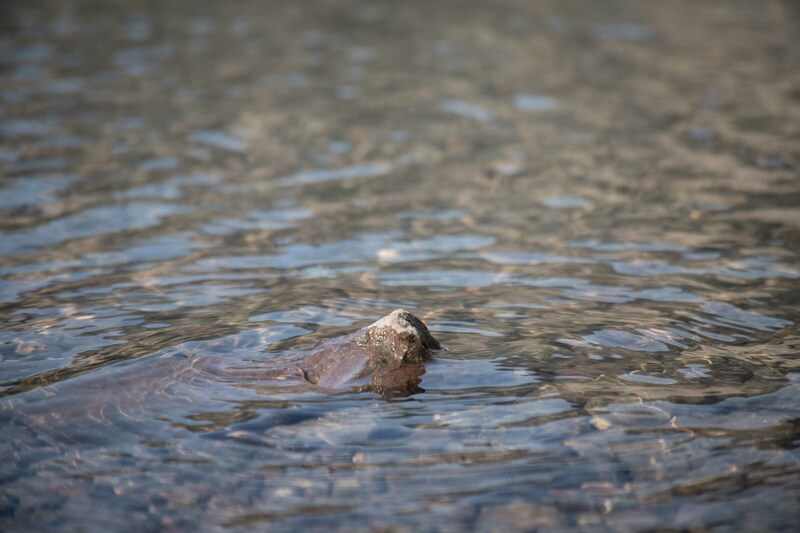 The cool water felt very nice in the high temperatures. The St. Bernard Lodge was very cute. Photo by Eric. 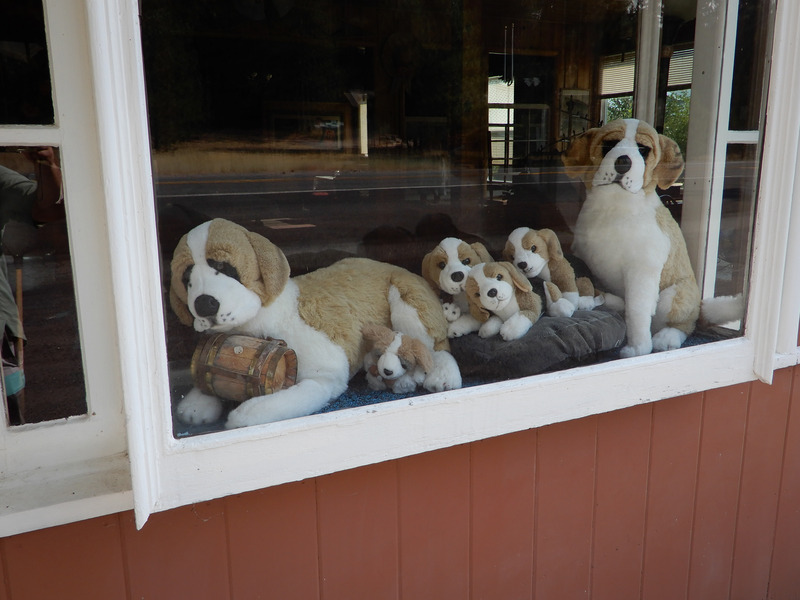 Eric took a picture of the stuffed St. Bernards who greeted us on arrival. We were a little too late for happy hour, but our host, Sharon, brought us up to the small but lovely Evergreen Room. 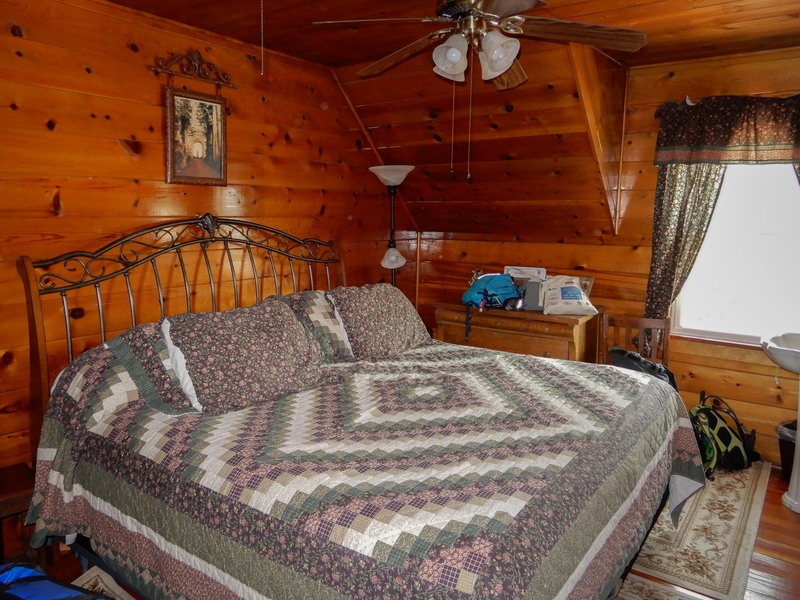 The entire interior is paneled in this exposed Lodgepole Pine. We had some time to relight our candle and repeat our vows to each other and even have a little nap before it was time for our dinner reservation in the lodge's restaurant. The food was excellent, particularly the sauteed mushroom appetizer, flavored with garlic, wine, and some herbs, with bread to mop up the sauce. We shared shrimp scampi and very crisp fried chicken, with Italian green beans and baked potatoes. There was ice cream for dessert. Sharon's service was great. We talked with Sharon about our plans. She didn't think the Cinder Cone was a great idea, given the heat and the smoke. 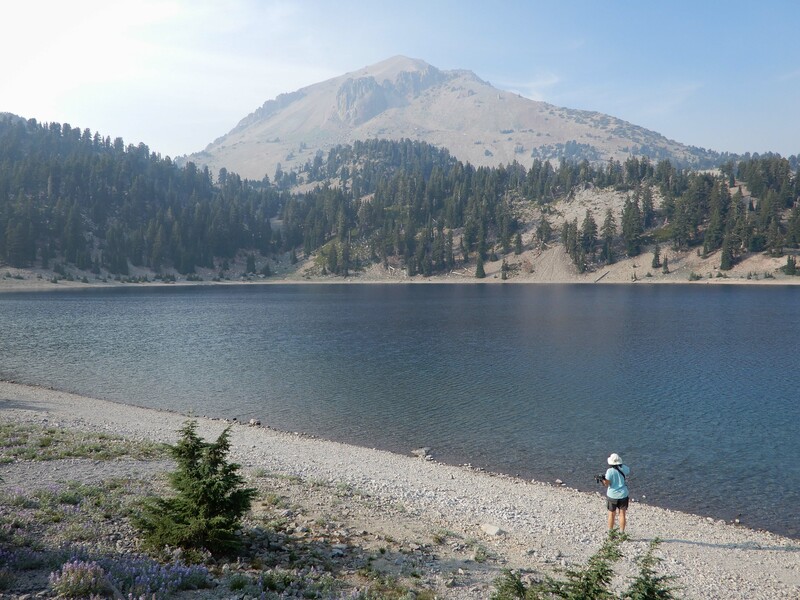 She recommended going to Subway Cave as planned, but doing something else as our other activity, perhaps taking the Weeble out on Butte Lake, or hiking the Spatter Cone Trail. We decided to hike the Spatter Cone Trail. The Spatter Cone Trail would be only half the length of the Cinder Cone Trail, and considerably less strenuous, so this would give us some extra time. We played a couple of games of 8-ball at the table in the bar. As usual, my primary skill at pool is not at all knocking the balls into the pockets, but balancing the cue stick on top of my head. I excel at this. Although Eric soundly beat me twice, I found that I was at least occasionally able to knock one of my balls into a pocket if I worked at an abysmal pace, thought very carefully about Newtonian physics, and leaned far down to examine the manner in which the balls and pockets were lined up. It was all a pleasant diversion. Eric also enjoyed the classic PacMan machine, and was quite pleased with his 25,000-point performance. 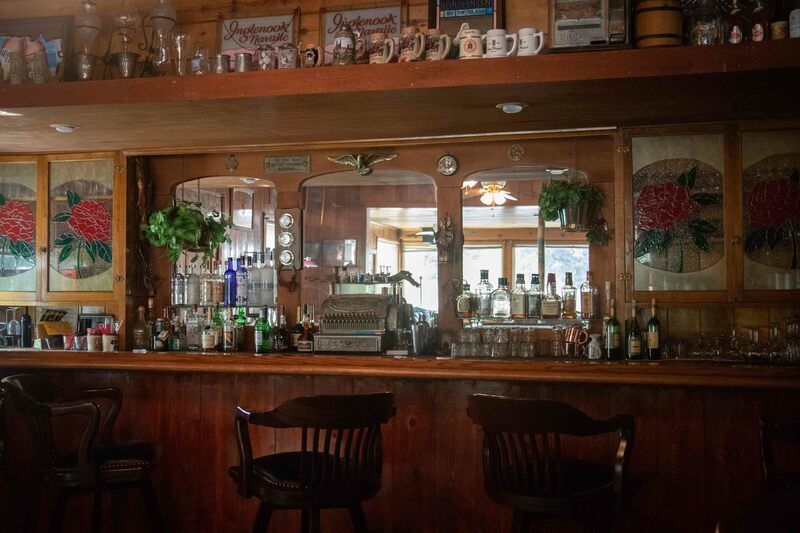 A B&B with a bar is a great idea! The lodge has two bathrooms shared among six guest rooms, but we had no problem getting into the showers since we were unhurried and sleeping a bit late. We had a lovely breakfast buffet in the restaurant, with yummy hash browns and a delicious frittata. Later, of course, than we should have even with our revised plans, we packed up and set out on the road. 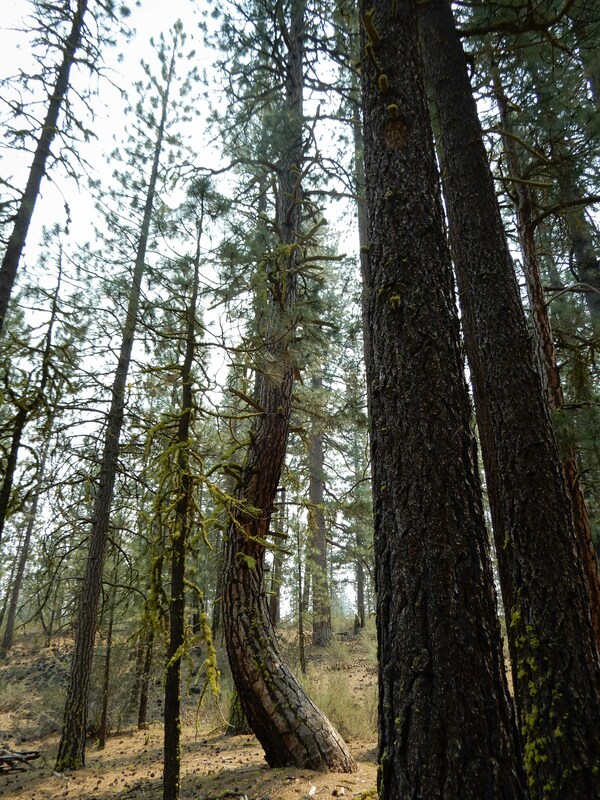 Setting out on the Spatter Cone Trail, Eric found this oddly bent tree. 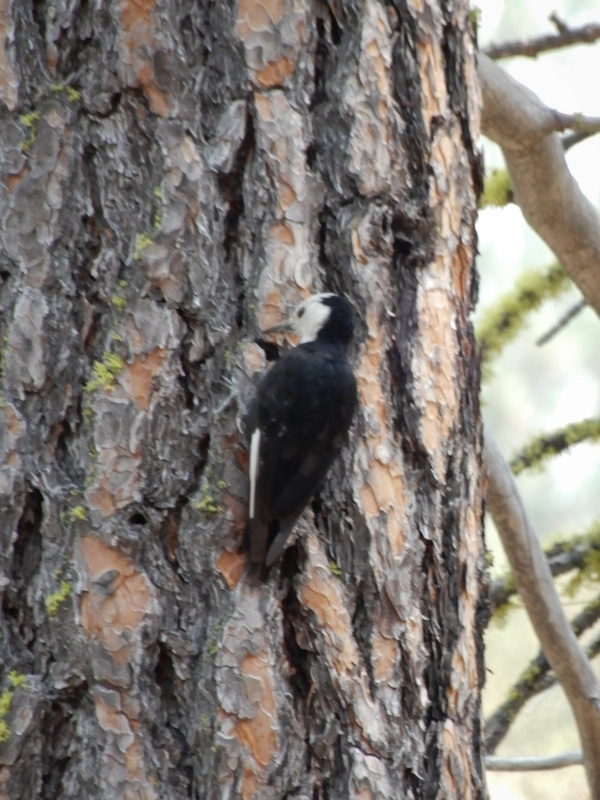 Eric spotted this White-headed Woodpecker. 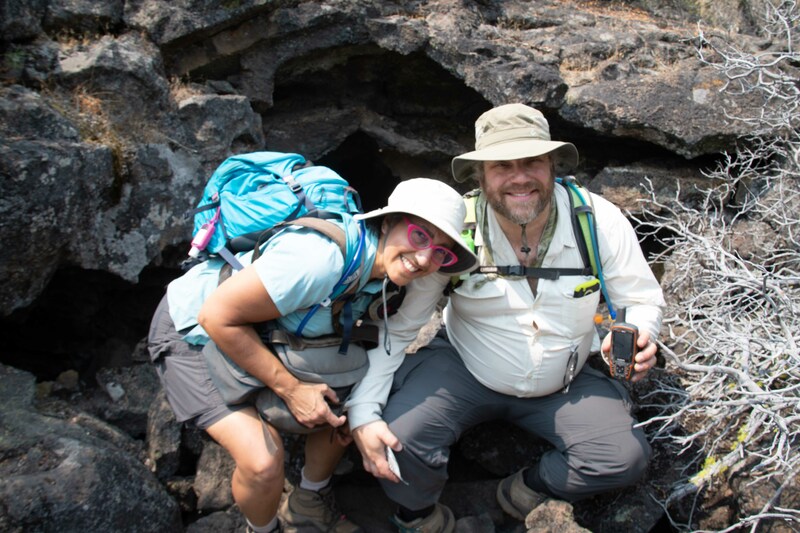 We followed a cute interpretive trail though some fascinating formations, such as spatter cones and lava tubes, in the 30,000-year old Hat Creek lava flow. Surrounding the trail was what would have been stunning scenery on a good day but instead was a brownish haze. 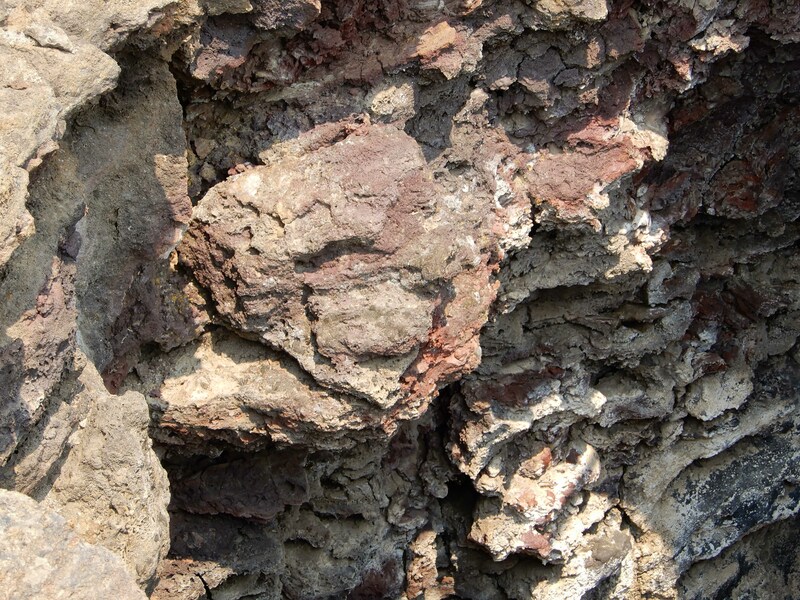 The trail featured fantastic examples of columnar jointing in the lava. I loved these tufted twists on a willow tree. We took a picture of ourselves in front of Bat Cave. This photo was primarily taken for an earthcache, but it was kind of romantic. 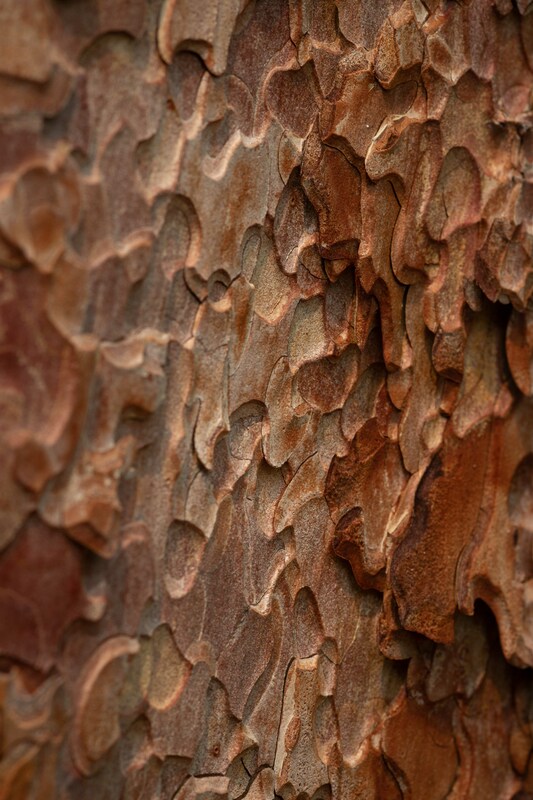 Eric took a picture of the intense colors in something that the trail guide identified as "Beaut Cone." I imagine it's probably supposed to be "Butte Cone," but who knows? 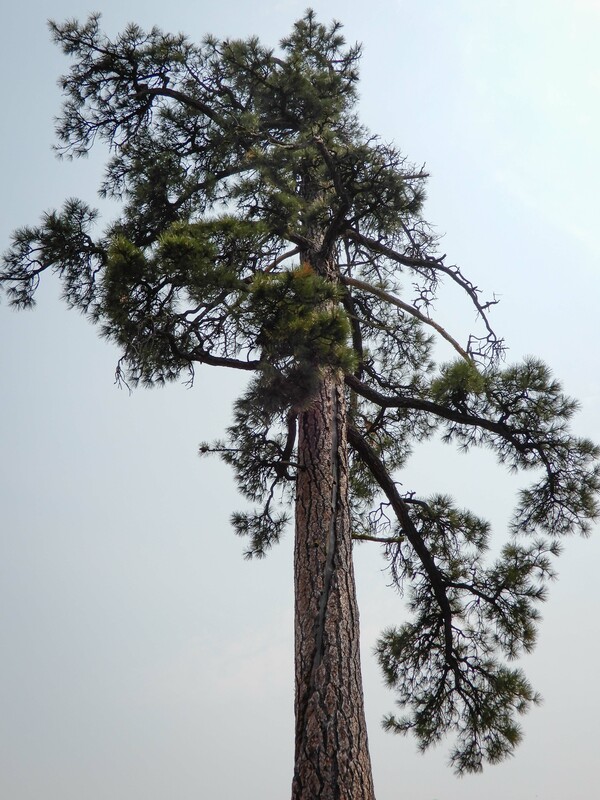 Eric took a picture of Solitary Sentinel, a Lone Pine scarred by lightning. 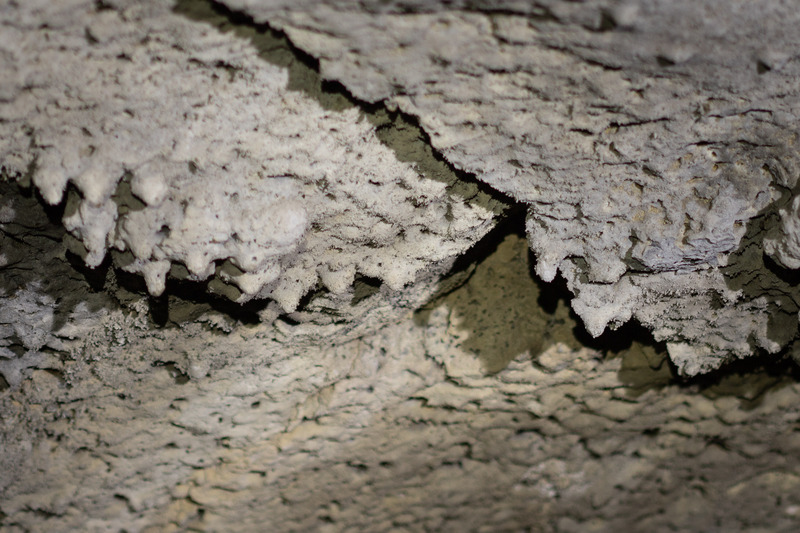 The last stop on the trail, Spattertube, was both a lava tube and a spatter cone. 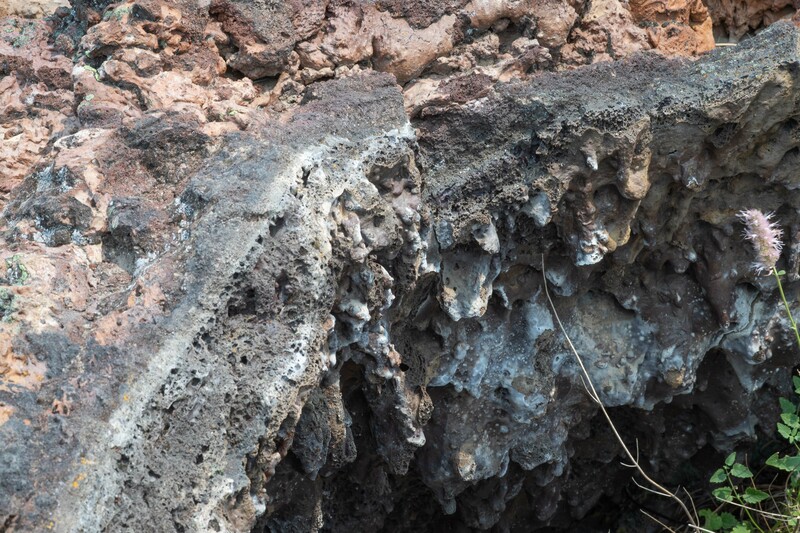 It also featured these lavacicles, bits of lava that dripped as they cooled and hardened. Eric's view of the lavacicles. As this was Lassen National Forest rather than Lassen National Park, we could look for physical caches. 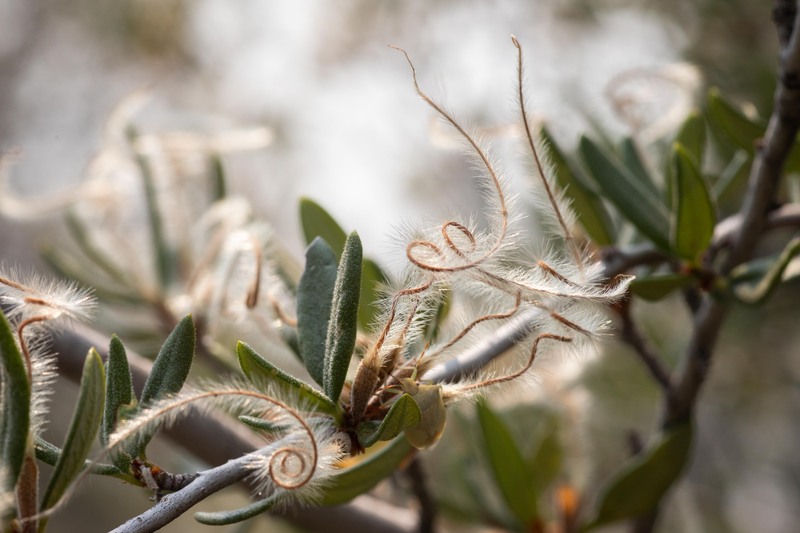 The power lines were making our GPS signal bounce around a lot as we looked for one, but I did find some nice things to photograph in the woods. 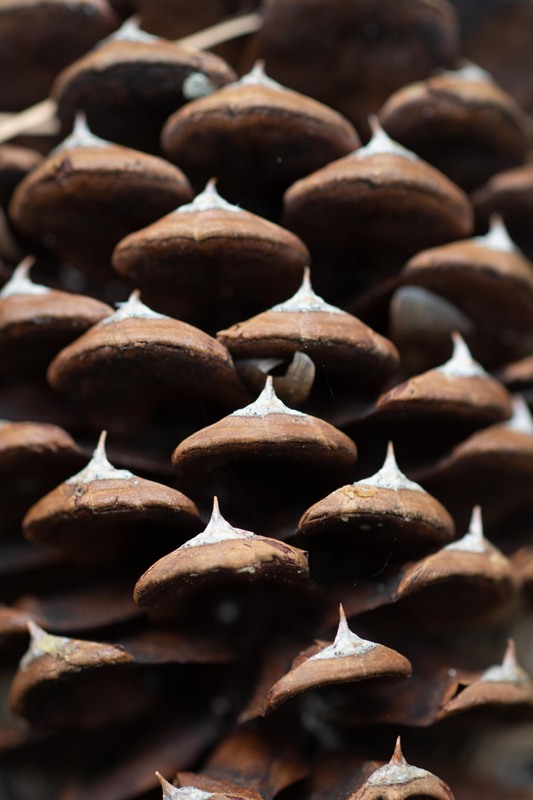 I think this is a Jeffrey Pine cone. Eric took my picture entering the lava tube. Eric took a picture of the inside of the tube illuminated by his flash. It was actually quite dark, and nicely cool after the heat outside. 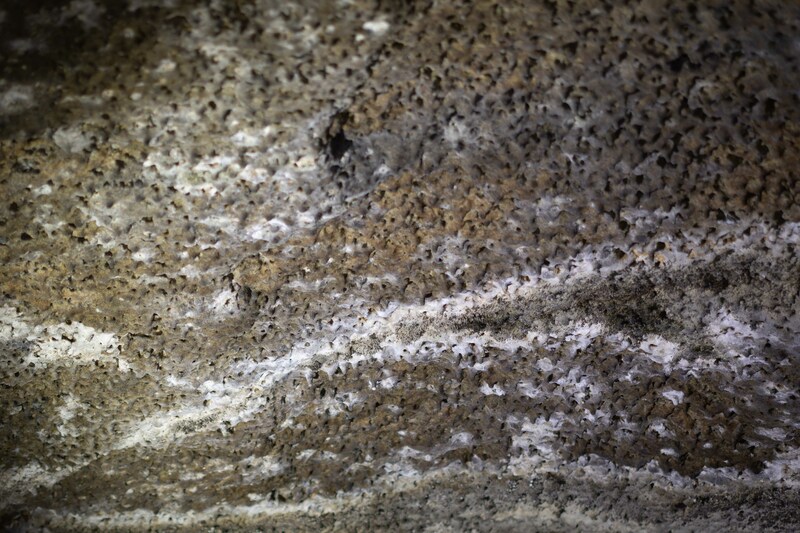 Recall that lava tubes form when lava running along a surface cools and hardens on top, while the lava underneath remains hot and molten and continues to flow through, leaving an empty space. 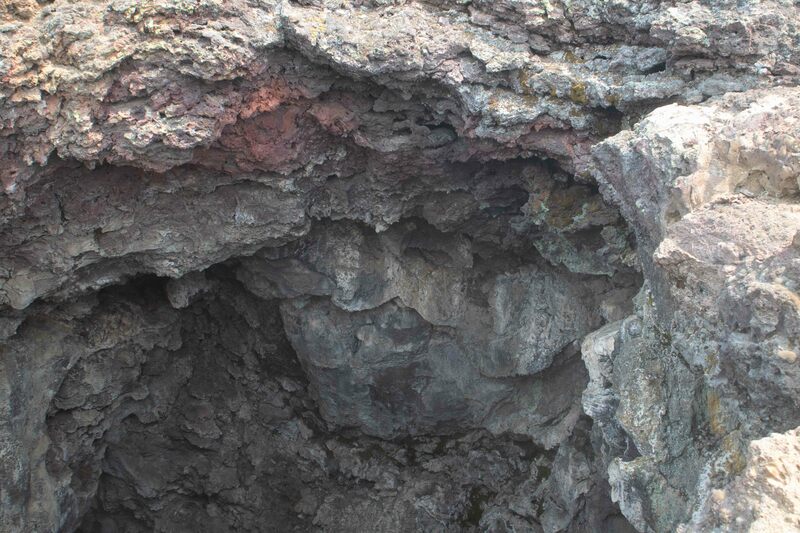 Subway Cave, as one of the interpretive signs told us, is actually the upper of two stacked lava tubes. 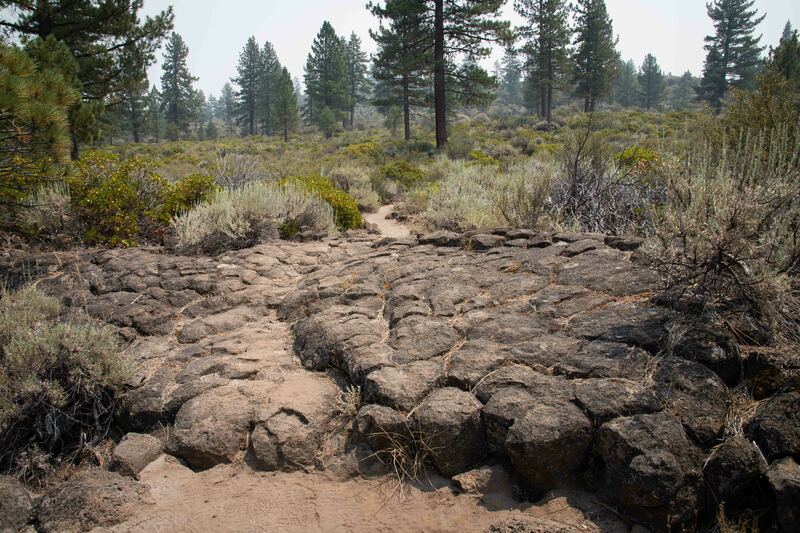 It was formed from the same Hat Creek lava flow that formed the spatter cones we saw earlier. 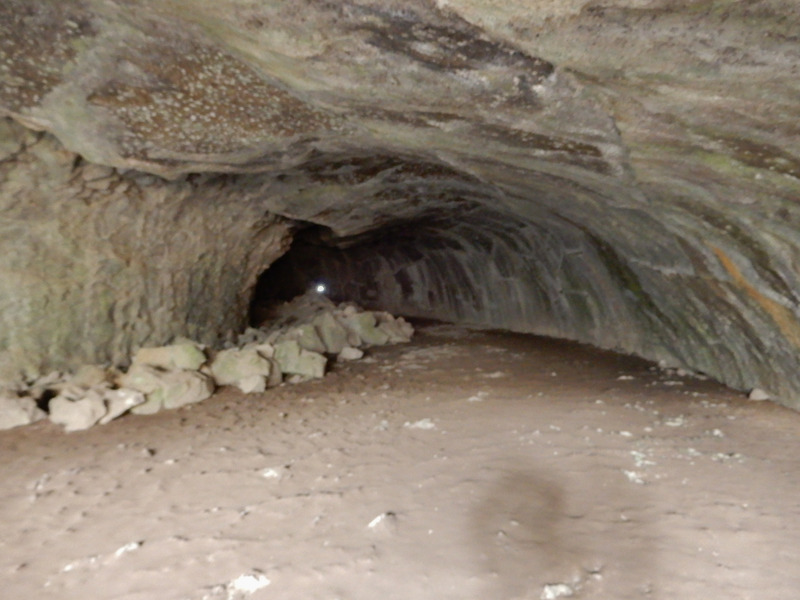 Two different lava flows ran through Subway Cave. I think I took this picture to show the high "water" mark of the lower of the two flows. 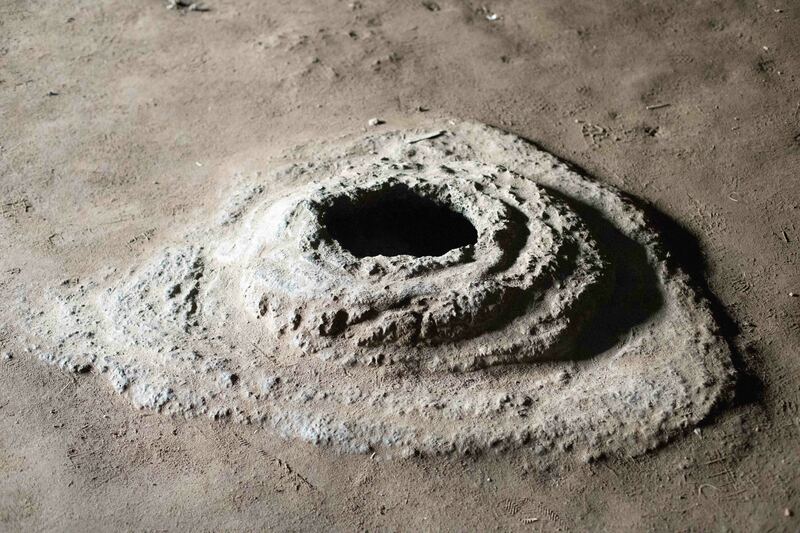 The roof in Lucifer's Cul-de-Sac sparkles with the shine of groundwater percolating into the cave from above. 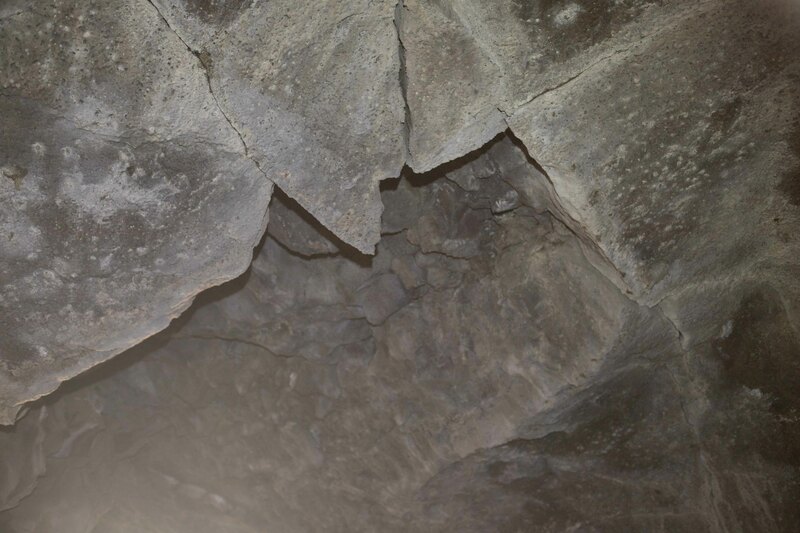 Here we can see where the roof collapsed during the formation of the cave, leaving a pile of lava rocks underneath it. 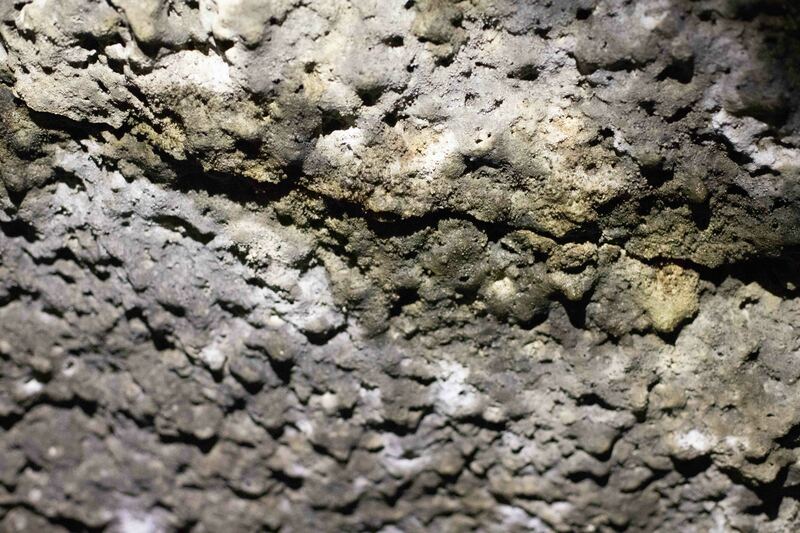 Lava coiled near the far end of the cave. 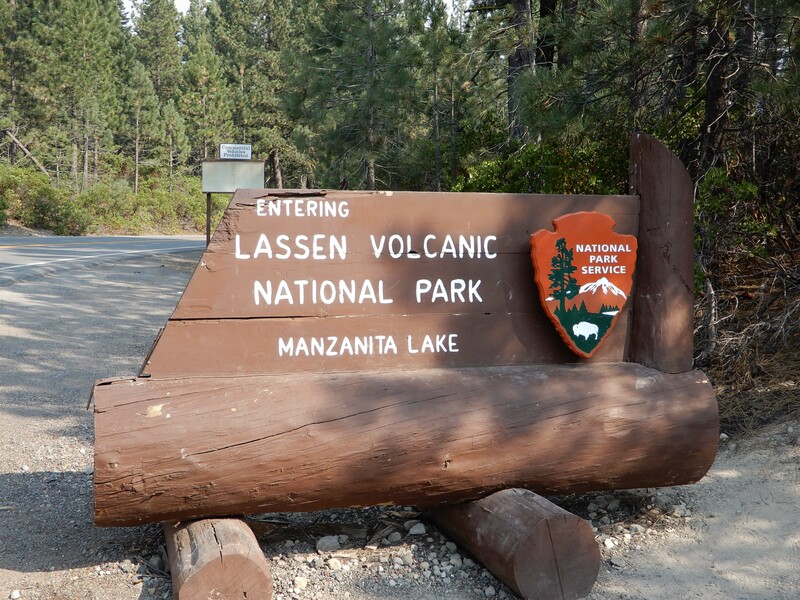 It was a stretch timewise, but we decided to take the scenic route through Lassen National Park. This is our seventh national park visit together this year! Eric took his usual picture of the park entrance sign. View of Mt. Lassen from the parking lot for the Summit Trail. 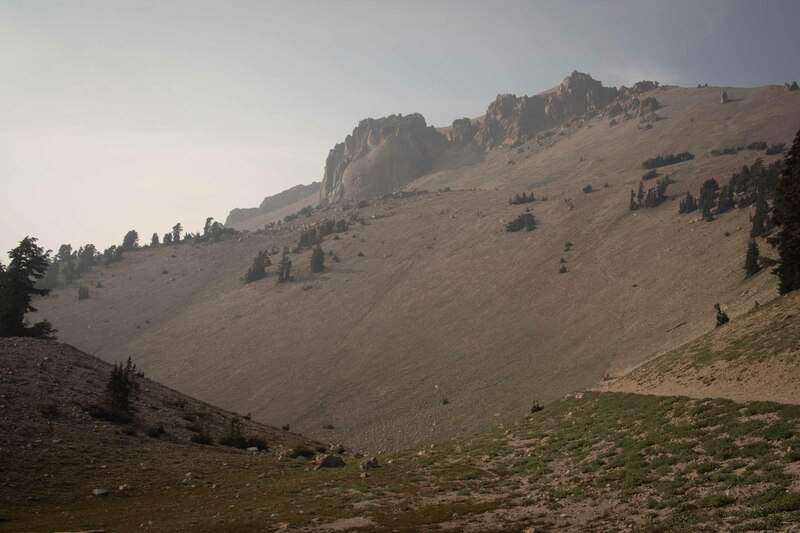 I have deliberately not dehazed the photo so you can see how bad the smoke was, even at 2,600 m/8,500 ft.
Lassen over Lake Helen. 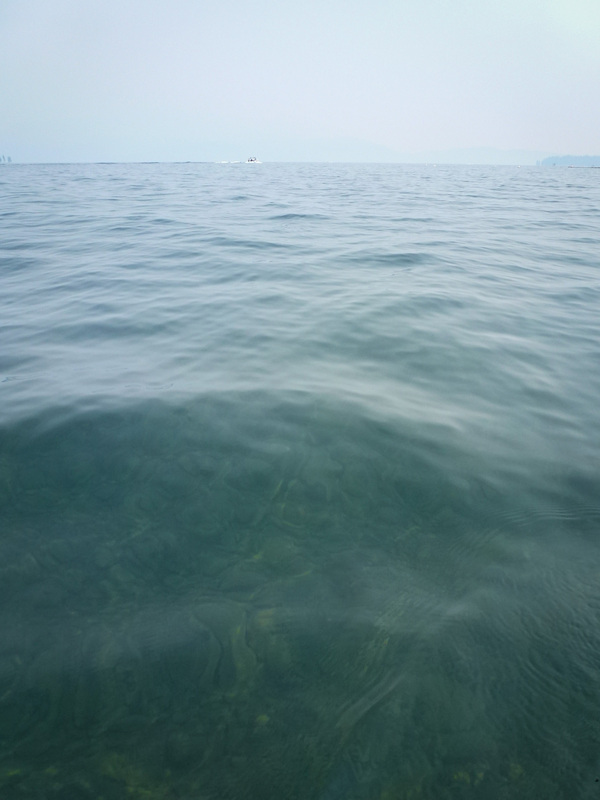 Again, note the contrast between the clarity of the water and the haze of the air. 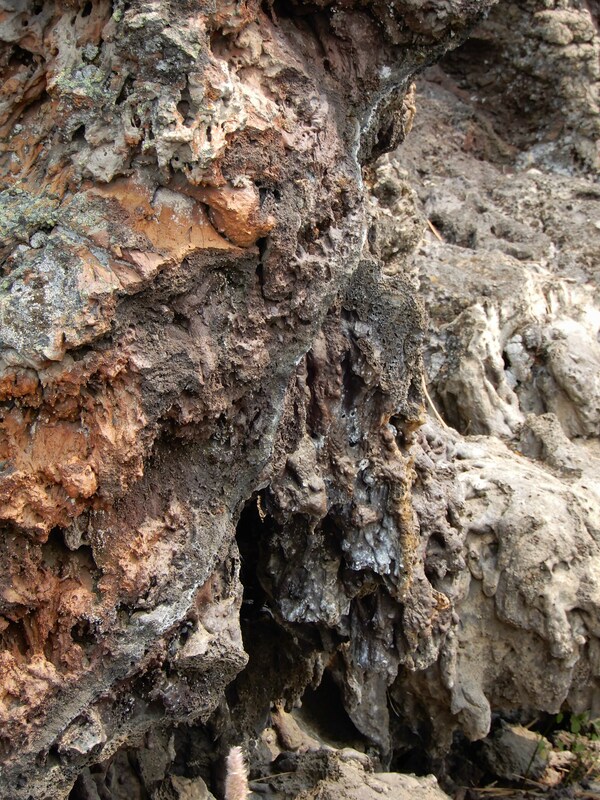 Somehow the tip of this rock remains dry in Lake Helen. The smoke just got worse as we headed back to I-5. 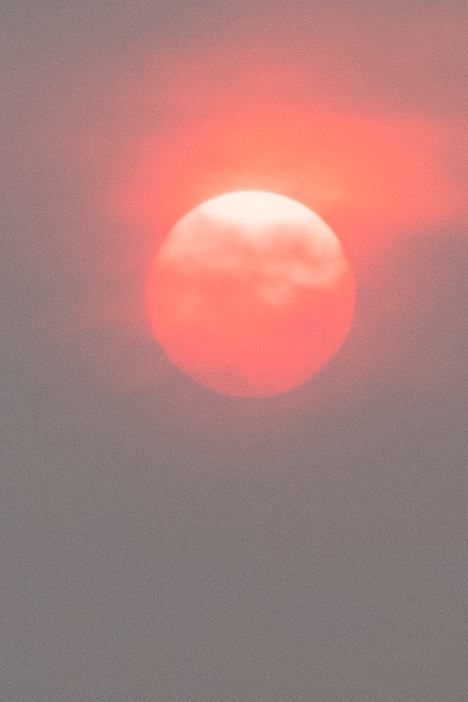 We stopped at our "favorite restaurant" (by frequency of visits), a Subway in Corning, where I took a picure of a very, very red sun. It can be hard to have a smoke-free anniversary celebration in northern California when you got married at the end of July. But not all anniversaries are quite as smoky as this one. We made the best of it and enjoyed a sweet getaway weekend together. Someday, we'll manage to hike the Cinder Cone together (perhaps at a different time of year).